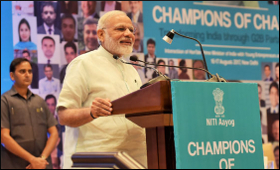 The Prime Minister Narendra Modi Thursday interacted with startup entrepreneurs at the "Champions of Change" initiative organised by NITI Aayog in New Delhi. In his address PM encouraged the entrepreneurs to work towards promoting the social welfare schemes of the Government among their employees. He emphasized that New India could only be built through the efforts of crores of ordinary citizens. He invited the entrepreneurs to join in this effort. Six groups of Young Entrepreneurs made presentations before the PM on themes such as - Soft Power: Incredible India 2.0; Education and Skill Development; Health and Nutrition; Energizing a sustainable tomorrow; and Digital India; New India by 2022. Appreciating the new ideas and innovations envisaged in the presentations made by the entrepreneurs, the Prime Minister said, that in times past, social initiatives had catered to the requirements of people at large, and these movements were spearheaded by eminent people in society. The Prime Minister described the "Champions of Change" initiative as one effort to bring together diverse strengths for the benefit of the nation and society. The Prime Minister said this initiative would be taken forward and institutionalised in the best possible way. One possibility could be to associate the groups that made presentations today, with the respective departments and Ministries in the Union Government. He gave the example of Padma Awards to say how processes can be transformed to recognise hitherto unknown heroes of society. The Prime Minister said the team of senior officers in Union Government are keen to explore new avenues and ways for the betterment of people. He encouraged the entrepreneurs to continue their ideation in their respective groups. He said that if they did so, they could go a long way in furthering the cause of governance. The Prime Minister said a lot of small changes have been brought in by the Union Government, which have brought significant results. He said trusting the common man, through self attestation of documents is one such initiative. He also mentioned the abolition of interviews for Group C and D positions in the Union Government. Narendra Modi said that today there is an "app" for filling every gap. He said technology and innovation should be harnessed to transform governance. He said decentralised structures are important to nurture the rural economy. In this context, he mentioned the role of startups in catalysing transformation. The Prime Minister emphasized the importance of good teachers in society. He said technology can provide a big boost to the quality of education. Several Union Ministers, Vice Chairman NITI Aayog Shri Arvind Panagariya, and senior Union Government officers were present on the occasion. The event was coordinated by CEO NITI Aayog, Shri Amitabh Kant.